Written by Janet Choi on August 25, 2016 . Behavioral email can take a back seat for mobile app marketers, who focus on communicating with people through in-app messaging, push notifications, or within the product itself. The problem with that strategy is that it relies on how much customers are using your app. And no matter how good you are, your app probably isn’t a core part of your customer’s day-to-day lives. But email is. People check their emails 15 times a day on average. And according to email analytics platform Litmus, over half of all emails are opened on mobile. Your users are just a thumb-swipe away from your app. Behavioral email act like an extension of your product by relating directly to the actions your customers have taken — which means you can reach people with relevant, personally-tailored calls-to-action that feel like a natural next step for them to take. With mobile deep linking, you can even decide exactly what part of your app to send those users to, prompting the exact behaviors you’re looking for. Behavioral email is the perfect way to get your customers in the habit of using your app. Here are five examples of behavior-triggered emails to get your mobile app users engaged and coming back. User onboarding is the most important moment of the customer lifecycle. 80% of users delete the average app within just three days. But on the flip side, apps with great onboarding see retention boosts well beyond those three days, throughout the entire customer lifecycle. Early retention is crucial, but also incredibly difficult. When most people open an app, everything is unfamiliar. If it’s not immediately obvious what they’re supposed to do, they’re not going to spend all day figuring it out. After all, they were doing fine without the app. They feel no attachment to it yet, which makes the decision to uninstall it really easy. 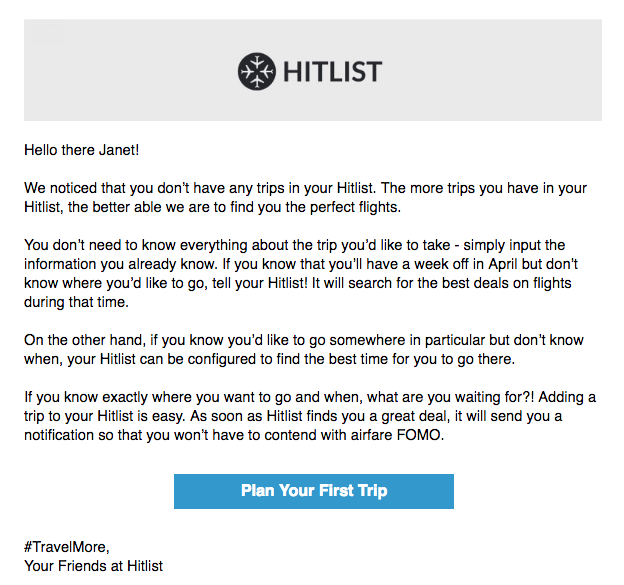 The flight-finder app, Hitlist, fights those obstacles by setting triggers for new users to receive a behavioral email if they haven’t planned any trips after a few days past signup. At first glance, this is a pretty plain email but what they’re saying is helpful to a new user, explaining not just why using the app is worth your time but telling you exactly how to make that happen. The reinforcement of why and how you should try the app out makes starting much easier — now that I know I don’t need to know exactly when or when my trip is to get value out of the app, I can go hit that button to poke around the app the try planning my first trip. Onboarding is all about getting users to that aha moment—the time when your app delivers whatever improvement or value it promises—as quickly as possible. Onboarding software experts Appcues explains how “your product’s onboarding process is where users will learn how to use their newfound powers” — and sometimes you need to prompt people to get to those learnings and aha’s by communicating outside of your app. 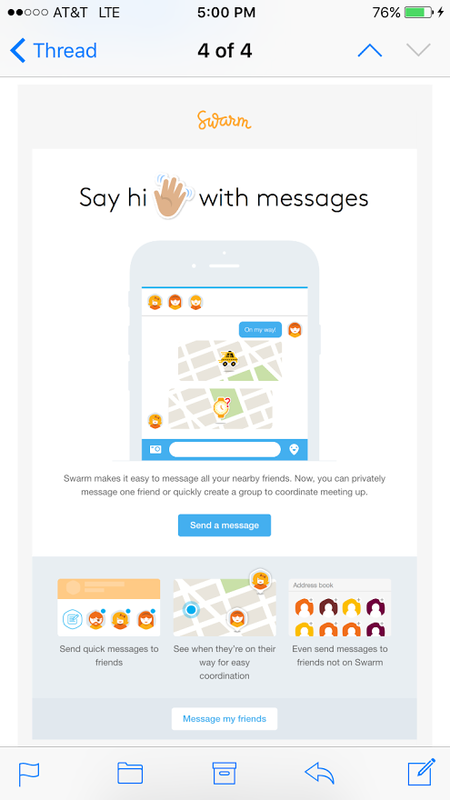 Check out how Swarm hypes up its new messaging feature in this email. It gives users a quick overview of why the feature is valuable and how to use it, followed by two buttons inviting them to try it for themselves. Those buttons then use deep links to open Swarm and send them right to the messaging feature. What’s great about this email is that it quickly explains the value of the new messages feature and sets the stage for the customer to try it immediately — it’s just a tap away — while their curiosity is highest. But this strategy applies to more than new features you build. Many people will gravitate towards the one or two features of your app they like the most and then don’t try out any others. That means they’re missing out on some of the best parts of your app. Getting them to use those other features and discover new value works wonders for retention. You can use an analytics tool like Amplitude to see which features are underused or to identify which parts of your product are most popular. Then trigger an email like Swarm’s above to get them to try something new. Pro tip: If your mobile app also has a web version, make sure your deep links account for that. If the customer opens the email on their desktop, the link needs to send them to the appropriate part of the web app. 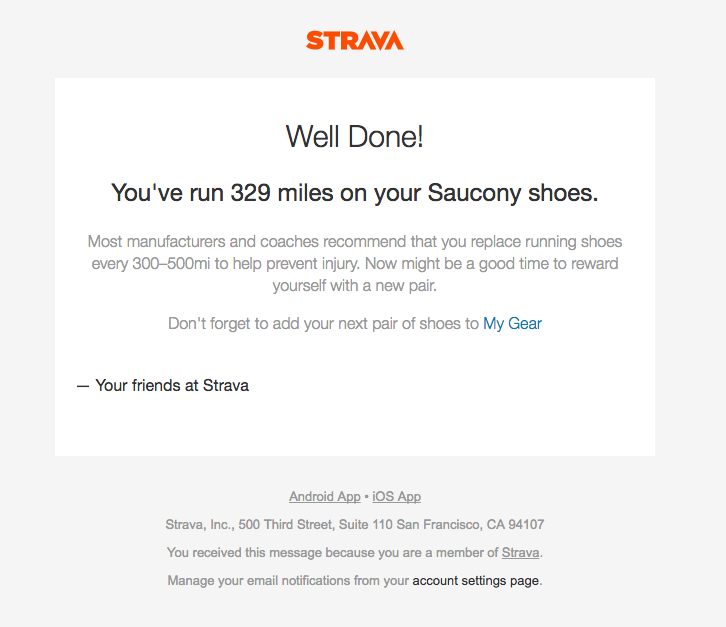 Fitness tracking app Strava sends users emails like this when they hit certain exercise milestones. Each triggered email automatically pulls personalized data on the user from the app to make it feel crafted just for that recipient. In the short-term, an email likes this makes people feel good about how much they’ve worked out, plus there’s the handy reminder that it might be time to invest in some new shoes. But in the long term, it also reminds people of the value they get from using the app. It’s a classic positive feedback loop. Psychologically, we get a rush from these kinds of rewards and are motivated to repeat the actions that lead to them. It reinforces the feeling that you’re helping your customers make progress on their way to real achievements. The key is to monitor your customers’ success metrics—the number that shows the customer is using your app productively. For Strava, that number is miles run while using the app. For Uber, it would be rides taken. Whatever it is, celebrate your users with a personalized email whenever they hit a new meaningful milestone. Great behavioral emails aren’t sales-y. They focus on building a relationship with the customer that’s based on trust, even when it comes time for the upsell. Most upsell emails come off like a bad cold call: unwanted, one-size-fits-all attempts to get more money. But behavior-triggered emails like the one here from Instapaper are more successful because they take the users’ activity into account, and offer them a way to get more out of the app. It’s not about selling the product, it’s about making sure the customer can continue using features they like. Instapaper lets users save articles they want to read later across all their devices. Premium users also get to make highlights and add notes to pieces of text, but free users can only do that five times a month. When those free users get close to the limit, Instapaper alerts them by email and invites them to try out the premium service. 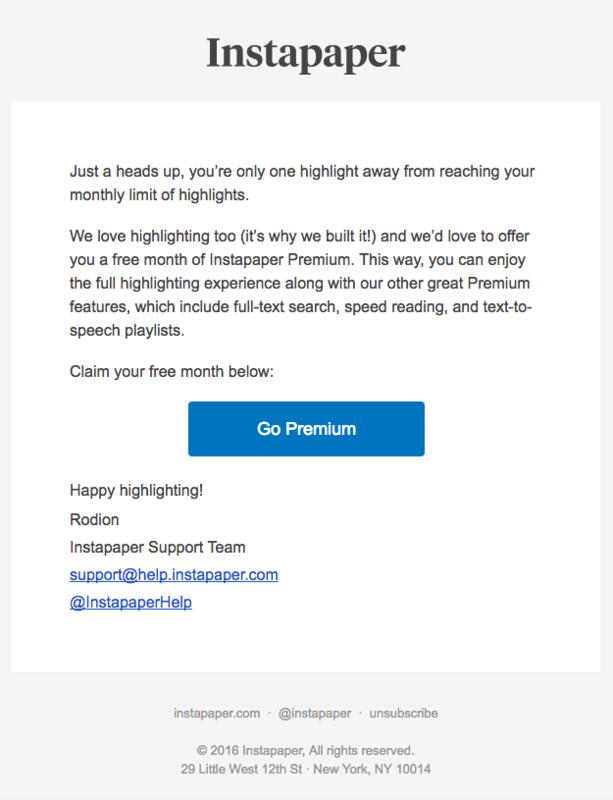 By emailing free users who push the monthly highlight feature to the limit, Instapaper is targeting the people most likely to upgrade. That, combined with the free month, is a strong incentive for them to try premium. And since the email is also alerting the user that they’re nearing the limit, it feels more like a helpful reminder than a hard sell. One of the biggest mistakes users make with retention is assuming that people are gone for good when they cancel (or uninstall!). Don’t abandon people just because you think they’ve left you. 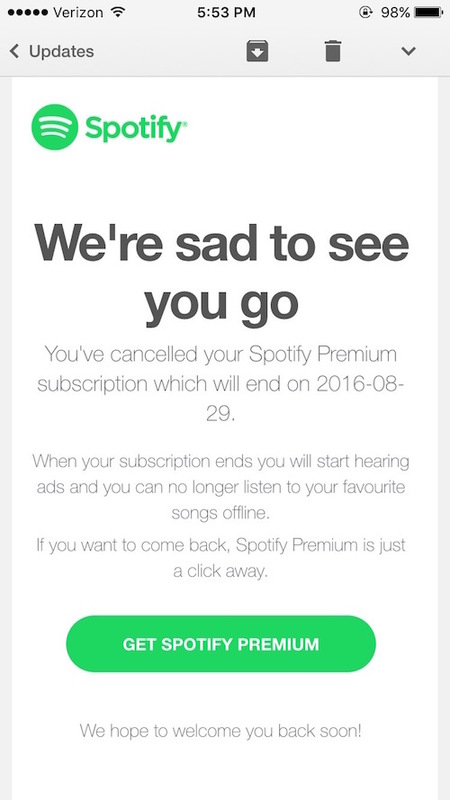 Re-engage churned users with a timely email like this one from Spotify. When premium Spotify users cancel or downgrade to the free plan, they get an email like this — which includes a little reminder of the features — like no ads — that they’ve grown accustomed to and will lose. Then, it provides the chance to reverse the cancellation with a single click of the eye-catching “Go premium” CTA. With this email, Spotify takes the time to make the argument that canceling might not be the greatest decision — but without being too pushy or weird about it. Then, it makes resubscribing to the service pretty easy — just a click away! The key is to have this email trigger as soon as the user cancels. It serves as a transactional record but also makes a pitch for when someone might still be on the fence about their decision and be willing to listen to you. Take the opportunity for your communication to go up to bat for your product. In order for your emails to improve the customer experience, they need to fit seamlessly with the experience each user has already had with your product. Behavior-triggered emails are the simplest way to achieve this sentiment. It makes your email messaging feel like a natural conversation rather than a one-way megaphone that people will want to shut off immediately. Thanks to the rise of mobile email and the power of deep linking, behavior email is even more powerful with mobile apps. If you reach your users with relevant mobile messaging, it won’t be hard to get them out of their inbox and onto your app, no matter where they are in the customer lifecycle. Have you seen any great or terrible examples of engagement emails from your mobile apps? Do share in the comments!